Recently I was curious about one of the streetcar disappearances To put it more simply, why did it say “technical problem” on the reader board with no known streetcar arriving or operating. Streetcars and electrical motors that power the streetcars are some of the most reliable, capable, powerful and long lasting components that humanity has ever put in a motorized vehicle. So why had the street had “technical problems” again? It seemed this happens on a somewhat frequent basis, contrary to the fact that the streetcars (and most electrical rail vehicles) are some of the most reliable vehicles on earth! I passed this thought back of my mind. I was on my bike, it didn’t matter to me or prevent me from doing the things I needed to do at that very moment. So I continued onward, unobstructed. Then a few nights later I stumbled across this blog entry by Hart Noecker “Veloprovo: Flower Petals and Parklet Fun – Round One” (read his blog entry, as it contains a lot of great info that pertains to the rest of my blog entry). I then find this video and pictures of why the streetcar was out of service! …and keep this in mind. This is EXACTLY why I took this photo a few mornings ago and labeled as I did. Some might have thought, “oh you’re such a jokester…” but no, seriously. The majority of incidents in Portland over the last decade have been almost entirely related to trucks killing cyclists. Sure there is the errant car, but considering trucking is a small percentage of traffic (7-15% depending on day, hour, etc) but contribute to about 50-80% of fatalities for the year… that’s pretty messed up. 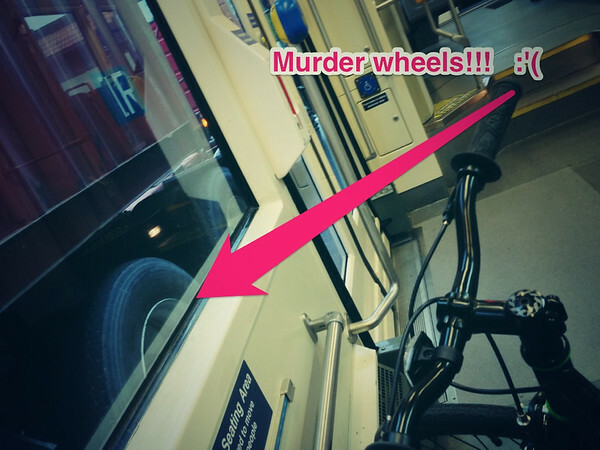 I wrote this “murder wheels” somewhat tongue in cheek. 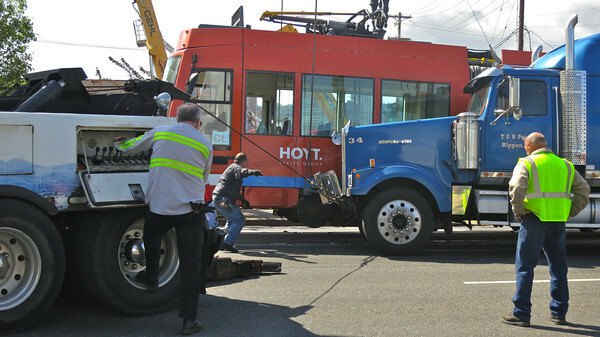 But in reality, more than a few people have been crushed by large trucks in Portland. The fact is that in the last decade pedestrians, drivers, cyclists, children & others have all been killed by these big trucks – and often because of this very inability they have to NOT be able to maneuver Many of these trucks do NOT even need to come downtown. Many of them are NOT actually even delivering something to downtown. They’re risking everybody’s lives. Entire cities, vastly bigger and more active than Portland exist that do NOT allow these trucks. Instead the focus in those cities is on people and what people actually want and need. What we don’t need is these massive trucks traversing downtown. In this case above that Hart captured, how much damage is that? 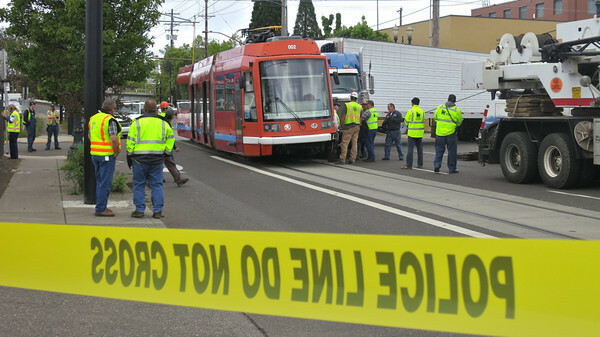 I’d bet it is somewhere between 10-25k dollars of repair damage to the individual streetcar, the truck also didn’t make its delivery, is probably a $1000 loss, it stopped traffic which could have caused somewhere between 5-20k in delay costs, and the riders that couldn’t travel, probably several thousand in revenue for the streetcar and even more in loss effort and revenue for local businesses. Overall, it was easily a quarter of a million dollars when one thinks of the holistic problem that occurred because someone couldn’t handle their truck. How much has to come out of the city budget now? What would have happened if someone was on a bike when that driver screwed up like they did and smashed into the streetcar? I’ll tell you what would have happend. Your son, or daughter, mother or father, grandpa or grandma, whomever was on that bike would be dead. D. E. A. D. Horrible enough for you yet? Well, I got to feeling a little bit better by watching the exasperated and exuberant Jason Roberts. He actually helped to fix a part of Dallas. Yup, that’s right. A city that is known for being wretched on so many levels, unlivable in many place and downright inhumane by most civilized nation’s standards. But he helped to start bringing livability back into a neighborhood. The simple fact is, we shouldn’t be putting up with things like massive trucks charging around downtown. We can live better, safer and healthier without this nonsense. If Robert can do it in Dallas, Texas we can sure as hell fix this issue in Portland! As Robert says, SHOW UP!!! Per Hart’s blog entry, come help with tactical urban parklets! Until next time, I’m off to sleuth up some more history, more ideas & plan the next move towards better living.